A deodorant stops odor by killing skin bacteria with biocides and masking odor through fragrance. An antiperspirant reduces the amount of available water on the skin with astringents, most commonly aluminum salts. Both types of product are generally water in oil or water in silicone emulsions, containing active ingredients (biocides or aluminum salts), emulsifiers, gelling, suspending or thickening agents, waxes, emollients, preservatives, colorants and fragrance. Flake/powder ingredients, such as cetyl alcohol are dispersed into the oil phase. The “dispersed phase” is prepared separately. Typically this is aqueous, however stick deodorants usually do not contain water; the dispersed phase would also be oil based. The active ingredient is dispersed into this phase. Suspending agents such as bentonite may be added. The phases are combined to form an emulsion. The active ingredient is sometimes added at this later stage. Gelling agents or polymers are added to stick products to form structure. Fragrance and coloring are added. The product is cooled and poured into containers, moulds, etc. Some ingredients can form agglomerates which conventional agitators cannot easily break down. Some ingredients require shear in order to develop their desired properties. 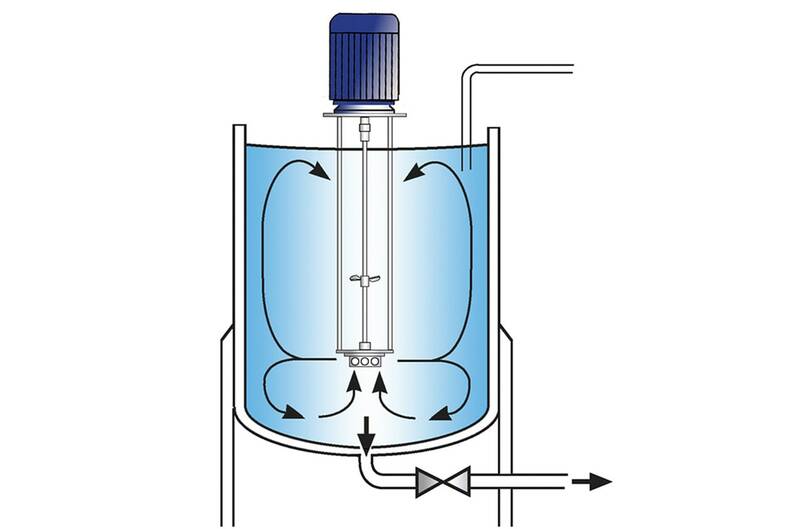 When adding powdered ingredients to the vessel partially hydrated materials can build up on the vessel wall and parts of the agitator. Some gelling agents are prone to degradation at high temperatures or low pH. 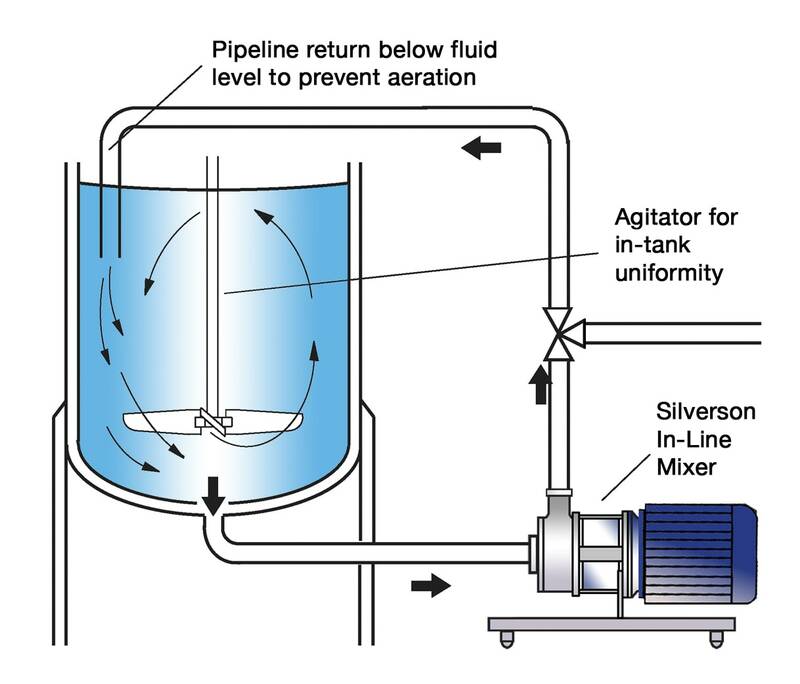 Conventional agitators cannot easily form stable emulsions even when both liquid phases have been heated. The vessel is charged with appropriate base fluid. The mixer is started, and the solid/powdered ingredients are added. The powerful suction created by the high speed rotation of the rotor draws liquid and solids into the workhead where they are rapidly mixed. The solids are de-agglomerated in the precision machined workhead before being forced out through the stator and circulated back into the mix. Simultaneously fresh material is drawn into the workhead. Once the powdered ingredients have been fully dispersed in the “continuous” liquid phase, the “dispersed” phase is added. 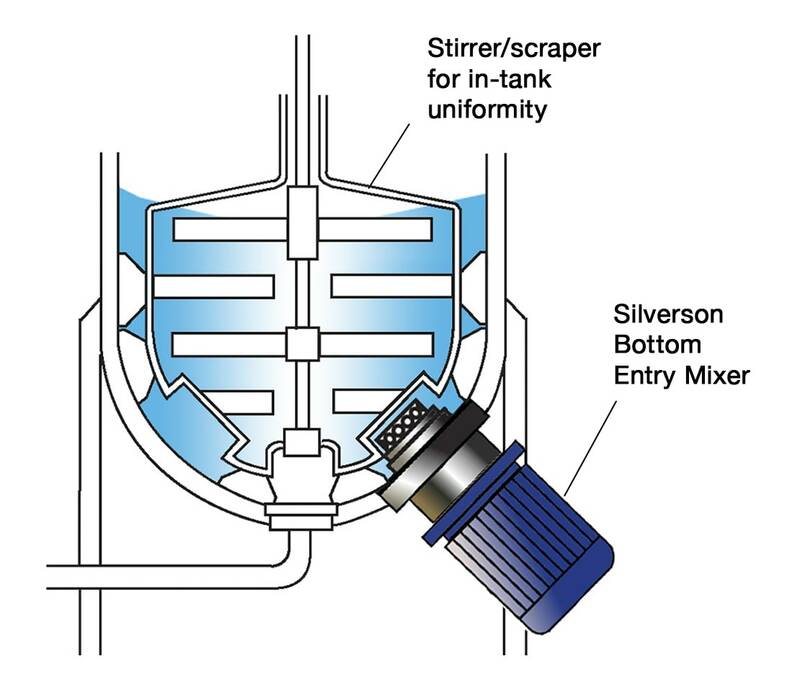 The high shear mixing action of the workhead forms a uniform and stable emulsion. Maximized yield of raw materials as thickening agents are fully hydrated and active ingredients fully dispersed. In many cases heating is not required, reducing costs and risk of degradation of heat sensitive ingredients.